Cambridge University Press, 9781107695016, 270pp. 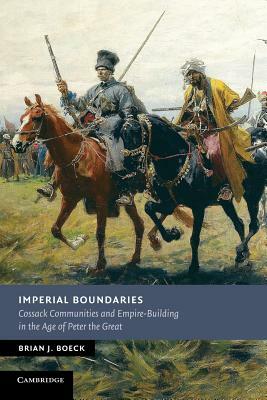 Imperial Boundaries is a study of imperial expansion and local transformation on Russia's Don Steppe frontier during the age of Peter the Great. Brian Boeck connects the rivalry of the Russian and Ottoman empires in the northern Black Sea basin to the social history of the Don Cossacks, who were transformed from an open, democratic, multiethnic, male fraternity dedicated to frontier raiding into a closed, ethnic community devoted to defending and advancing the boundaries of the Russian state. He shows how by promoting border patrol, migration control, bureaucratic regulation of cross-border contacts and deportation of dissidents, Peter I destroyed the world of the old steppe and created a new imperial Cossack order in its place. In examining this transformation, Imperial Boundaries addresses key historical issues of imperial expansion, the delegitimization of non-state violence, the construction of borders, and the encroaching boundaries of state authority in the lives of local communities.